Summer is upon us and for many families that means pool time whether it is in your own backyard, at a community pool, a friend’s house or on vacation. Children need to learn to swim. All children must appreciate the water and know how to be safe in and around the water. This is not a luxury, this is a necessity. Mimi Conner, Plano’s own Swim Whisperer answers some very important questions about swim safety. What is the best age to start your kids in swimming lessons? Child does a face-wipe with their hand, a quick blow, and pinch their nose (and the water goes away). Splashing, getting use to the water all around the body and face. Floating, lying on the tummy and the back. Kicking-making little splashes. If you have a backyard pool, community pool, lake or other bodies of water that you know you will frequently be in, then lessons are a must. Starting with an adult/child class teaches both the adult how to be and work with the swimmer in the water. It also builds a wonderful bond while also developing a strong appreciation of the water. The adult/child class prepares the swimmer for their first independent class. The younger the child, the easier it is to teach because they have not had time to learn fears or bad skills that would need to be undone. What are a few keys things I should look for in a good swimming lesson program? Check the facility out. Go and see it, talk to them and to their clients, observe a class, ask questions. Ratio: Instructor to swimmers, the smaller the better. You will pay more for smaller ratios. But your child will get more teaching, practice and time with the instructor. Experience: How well trained are the instructors? How old are the instructors? A young instructor does not mean they are not qualified; they perhaps just lack in experience. A new instructor has to begin somewhere, so a blend is good for any facility; bringing in young and mature is a great compliment. Attention: Safety should be the first priority. Keeping a class under control with positive behavior, respect and patience to all students. Clean: Is the facility clean, neat and user friendly. What kind of pool environment is better for swimming lessons? Finding the best conditions for your swimmer is important-if your child has a tendency to be cold, cold water may not be the best choice. In group lessons, children wait for their turns and waiting in cold water will be a bit more challenging. Salt water is a safe and is easy on the body and eyes for all swimmers. 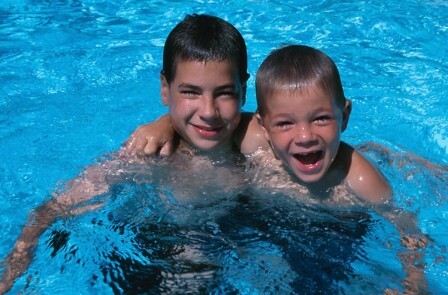 Children with skin allergies or sensitivities finding a salt water pool would be a great choice. Warm salt water would be a great compliment to any swimming lesson. This article is Part One in a two part series. My kiddo took her first swim lessons with Mimi at Aqua-Fit and we just adored the whole experience. I had done as much teaching as I knew how to do from when I was a swim teacher in my teens, but I was totally stuck teaching my happy swimmer how to backfloat. She hated it! She would flip instantly over onto her tummy every time we tried it, or fuss and kick and squall if I tried to prevent her from doing so. Mimi taught her how to backfloat (calmly) and with no trauma, as well as expanding well beyond the skills I knew how to teach. It was wonderful and I highly recommend Aqua-Fit lessons to anyone who asks. My HFA daughter lives in a community in Austin. While home for Christmas break Miss Mimi graciously allowed us to do a short-term membership and allowed my daughter and me to attend as many ague-fit sessions as we could fit in. It was such a help to us as the water exercise both helps Ab control her weight but is also great for regulating mood and concentration. Thanks so much, Miss Mimi.